Yeah, yeah, Christmas is over but I still wanted to share the mani I rocked for the holidays! Haha! Pinky: Two coats of Paper Mache and then two coats of set in stones (which isn't in the picture of polishes because I forgot, whoops!). Middle finger: Two coats of Paper Mache, followed by two coats of There's Snow One Like You. Pointer finger: One coat of Running in Circles and then two coats of Monster Mash. Thumb: Inspired by the mega-talented Bailey - two coats of Paper Mache and, when it was totally dry, I added the dots with a large dotting tool. The ribbon loops were a bey-otch, so I used the Stripe Rite brush that I "tailored" for my leg-lamp mani by cutting off all but about four bristles. Ha! 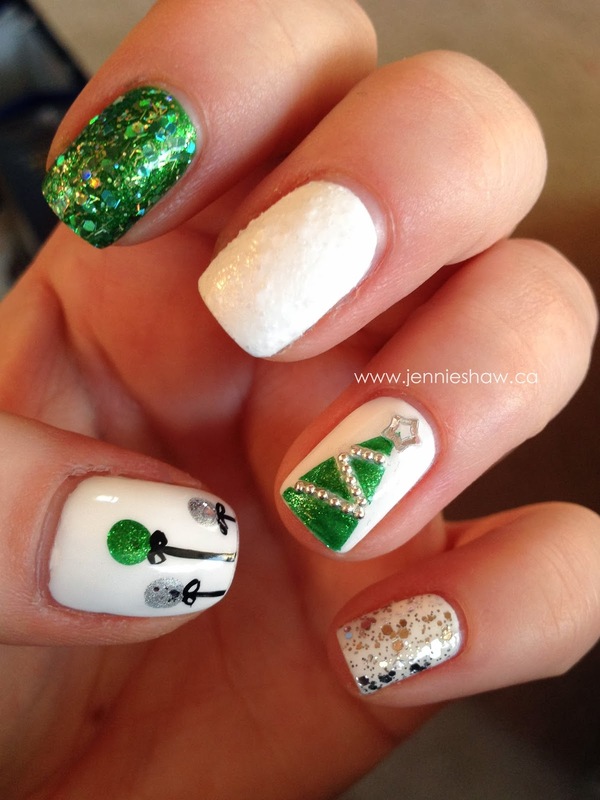 I reeeeally love this mani Jennie! Everything about it... including the fact that I inspired you :) The texture of that white CG polish is perfect for snow! Great mani! I love that green with the white. Especially like the pinkie with all the silver glitter! 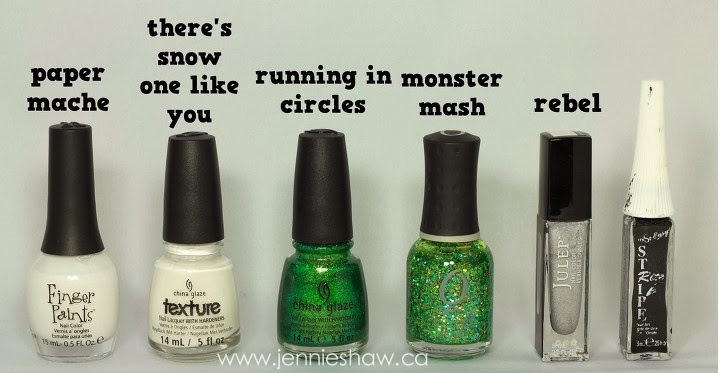 Oh, and Monster Mash...how did I not know about this polish? I love Orly polish!! Your tree & ornaments came out great.